The IBM XIV Storage System is a high-end flash optimized, fully scalable enterprise disk storage system that is based on a grid of standard hardware components. The architecture of the system is designed to deliver out-of-the box performance and ease of management while harnessing the high capacity and cost benefits of serial-attached SCSI (SAS) drives. The XIV Gen3 systems (and the Model 314 in particular) offer powerful real-time compression that is based on the IBM Random Access Compression Engine (RACE) technology. 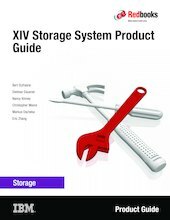 This IBM Redbooks Product Guide offers a brief overview of the IBM XIV Gen3 Storage System hardware and software features.